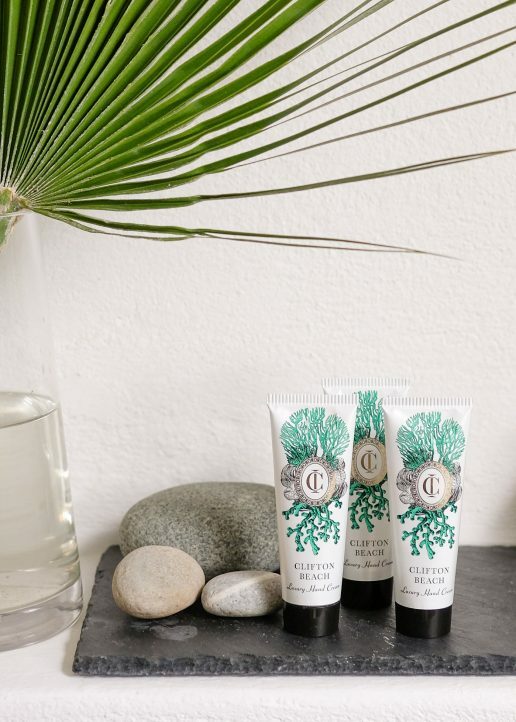 View cart “Constantia Heights Mini Hand Cream” has been added to your cart. Fill your home with the unique Clifton Beach fragrance where sun-warmed coconut and vanilla combines with the opulence of tolu balsam and a zest of lime. The scent is fresh, alluring and uplifting. This stylish 250ml scented candle has a single cotton wick and is beautifully packaged in a gorgeous teal box with gold foiled illustrations by talented local artist, Sharon Boonzaier. These candles are hand-poured in small batches to ensure the finest quality. Always burn candles in a safe place and preferably not in a drafty area. Keep wick centered and trimmed to 6mm to prevent smoking and soot build up on the container. Your initial burn should be a minimum of 3hrs – 4hrs in order to allow for a sufficient melt pool to form. Too many short burns will result in tunneling. Store in a cool, dry place.